David Cronenberg is one of Hollywood's leading figures at the moment. The History of Violence, his last film, is a truly astonishing piece of work that stars Viggo Mortensen and Maria Bello. It examines the ways that people are not what they seem and family life masks all sorts of compromises between violence and civility. Eastern Promises is another film about the dark underbelly of life- again Mortensen is a figure trapped between civility and darkness, violins and violence- and again Cronenberg wants us to examine the way that we live our lives and what lies just beyond our vision, round the corner, out of sight, behind our backs, in the dark crannies of consciousness. He wants us to remember that everywhere you go, a rat is only 6 metres away from you, despite the cleanliness of the surfaces you are eating off, there are rodents in the dark chewing at the things you throw away. 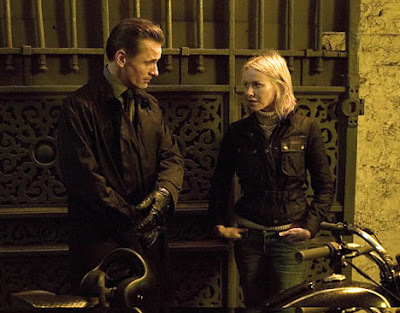 Cronenberg's canvass is wider in Eastern Promises. It is London- the city of immigrants- in many ways the defining city of our era. London is my city- and its wonderful to see a director use it as his canvass, without needing to provide Big Ben and the monumental architecture of neo-Gothic Victorians. Rather Cronenberg focuses on London as it really exists- or it really exists alongside that other existance in Westminster- the London of the East End, of Brixton and of suburbia. Its this London, filled with resturants, bars, drab barber shops and costcutter supermarkets, windy and rainy and dirty that he focuses on. Its a London filled with immigrants from every nation on earth, selling their own food and drink, socialising amongst themselves, talking in their own languages, and communicating with the wider society as well. The sense of this city's social architecture and the way that so many groups co-exist on its fringes owes something to films like Martin Scorsese's Goodfellas. Here, as in Goodfellas, we see a family involved in the mob from an ethnic minority that essentially runs that community inside London. There is a patriarch, Semyon and his objectionable son Kiril. Into this world comes Naomi Watts's Anna. Anna turns up in their world because as a midwife in a hospital she delivered a child from a mother- this child was different though because the mother died without providing any data to recover who she was. And Anna therefore embarks on a search to find out who the baby is and where its relatives live- a search which takes her directly into the world of the Russian mafia and into the lives of these three characters, Semyon, his son Kiril and his driver (played by Mortensen). The stage is set, and it would be unfair to tell the rest of the plot, suffice it to say that several murders are involved, that there is copious reference to the illegal world of smuggling and of prostitution and that the solution to it all is complex and allows us to reevaluate at least one of the major characters. Its a stunning film. The acting in particular is good. Mortensen has never been better- or rather if you have only seen him as Aragorn in the Lord of the Rings, you have missed out on his extraordinary work for Cronenberg. He has such presence on screen that its difficult to take your eyes off him and he inhabits his character entirely. Watts again is an actress of real class, she has done it before (Mullhulland Drive is one of the best performances by any actress for years) and though the part doesn't require extraordinary work, she does what she is required to do. In my judgement this isn't up there with the History of Violence, there is something slightly more random and slightly more normal about this film than about that masterpiece where an innocent world just blew up in front of you. But its still well worth seeing- this film shows us a real cinematic intelligence striving with a very contemporary issue. The way that our societies have become fractured and separated and the way that even in a small space like London, stories of unbelievable brutality may be happening just next door or down the street without you knowing. In part this is a fable of urban life- a Jack the Ripper de nos jours- reminding us that these are mean streets and the key to this film is that you have to be mean in part to walk down them yourself.